Lately I discovered bok choy in my Trader Joe’s grocery store and have cooked it several times in the past couple of months. It’s an easy vegetable to cook and it goes well with other sauteed vegetables. The other day I scored some cheap shrimp at the grocery, so I came up with this oriental dish for some early spring weather. It only takes about 20 minutes to make. Cut root end of bok choy off and rinse thoroughly. Steam bok choy until leaves are slightly wilted. In a large pan, add a 2 TBS cooking oil, saute pressed garlic, red pepper flakes, minced ginger, sliced carrots, and green onions over medium low heat. Cook until carrots are slightly soft. Add bok choy and saute for a minute. Push vegetables to one side of pan. If you purchased raw shrimp add to pan and cook until pink through, 2-3 minutes each side. 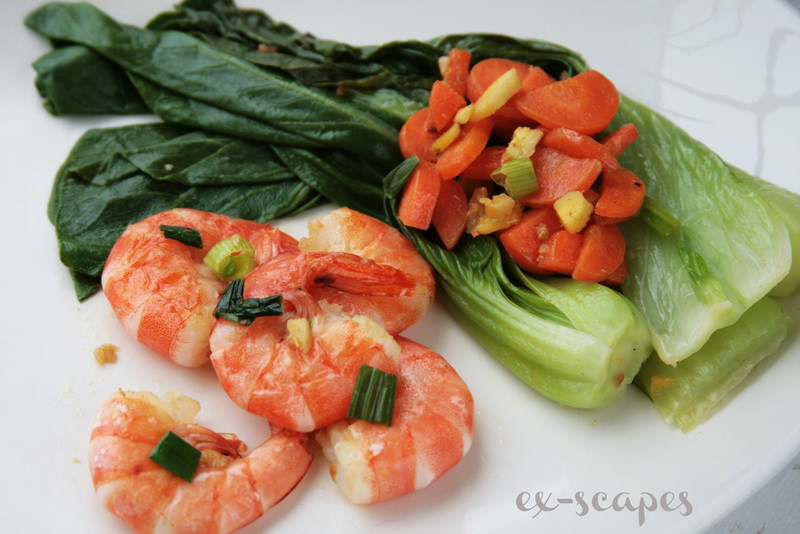 Once shrimp is nearly through, mix vegetables and shrimp to coat with oil and seasonings. Even easier, add pre-cooked shrimp and toss with vegetables to heat through.